The greatest gaming tablet ever made...? Nvidia has continued its hardware assualt with a new gaming tablet that is the first to feature its Tegra K1 mobile processor. Nvidia has taken the wraps off a new Shield tablet that will work with a Shield wireless controller for on-the-go gaming courtesy of the company's Nvidia Tegra K1 mobile chip. Built specifically for gamers, the tablet features an 8-inch, 1080p HD screen, front-facing speakers and the same PC streaming feature we saw in the original Shield. It's design matches the leaked images we saw last week. The tablet will also come with an optional cover that can double as a kickstand and storage choices are the standard 16GB or 32GB variants. Nvidia has built in LTE-functionality so that gaming doesn't need to be limited to a Wi-Fi connection. And the company states there will be regular, over-the-air upgrades pushed out to keep the Shield tablet on its gaming toes. It also boasts a new feature called Nvidia ShadowPlay that lets you capture gaming moments and share them using the video platform Twitch. Something that has become increasingly popular and is offered by consoles like the PS4 and Xbox One. 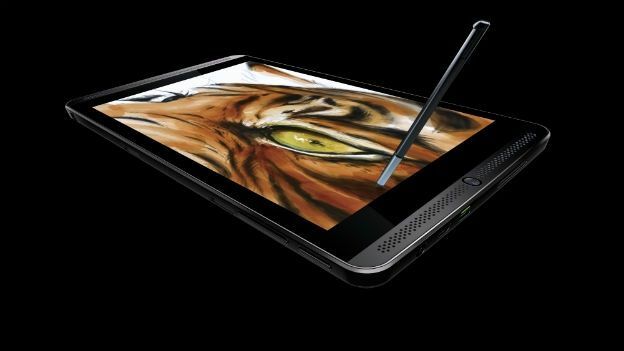 Catering to those with more artistic tendencies, the Shield tablet also makes use of the Nvidia DirectStylus 2 stylus that enables, so Nvidia says, the first GPU-accelerated 3D painting experience. “If you're a gamer and you use a tablet, the Nvidia Shield tablet was created specifically for you,” said Jen-Hsun Huang, Nvidia's co-founder and chief executive officer. The Shield tablet is available to pre-order now in the UK and comes in with a price tag starting at £239.99 for the 16GB Wi-Fi model and going up to £299.99 for the 32GB LTE version. Unfortunately, that doesn't include the wireless Shield controller, which you'll have to pick up separately for £49.99. The optional cover will set you back £24.99. Stay tuned to T3.com for a full review of the Shield tablet coming soon.